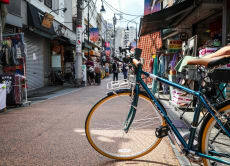 I offer cycling tours exploring different parts of Tokyo that only a bike can reach. I will introduce cultures and history in English throughout the tour. East Tokyo has a long history, and we can see more attractions in local streets as we get deeper and deeper. each district has its own culture like Ryogoku for Sumo wrestling, Tsukiji for the fish market, Asakusa for the oldest temple in Tokyo, and Oshiage for Tokyo Skytree. Let's enjoy the many faces of Japan! I lived in America for 5 years and Myanmar for 2 years and a half, and I have traveled to many countries in North and South America and Asia. I studied sociology in university and learned a lot about culture and society. In my opinion, Japan has a lot of unique cultures in terms of food, religion, techniques, and entertainment. I would love to share these interesting cultures through my cycling tour! Let's enjoy Tokyo in the best way! Our guide was realky nice and helpful. He took us to interesting places and provided a lot of useful information about those. He was indeed mindful of the speed we used and always looking out for the group. It’s a unique experience de to do some cycling in a tokyo with Shoto who is a local! Shows you places you would never think of and speak perfectly english. I had so much fun, we did 16km that day, went to temples, had amazing food, got the time to buy some souvenir, shoto made photos of the groupe! I highly recommend the tour ! Thank you Shoto. Well worth it. A unique experience!